What Next for Women and Children Immigrants? The transfer of 140 undocumented immigrant women and children from Central America to San Diego via Texas has reignited the immigration debate and fueled many concerns and claims by opponents. This group was flown into San Diego Tuesday in a chartered plane, to help alleviate the strain on U.S. Border Patrol in Texas. The immigrants were then transferred onto buses destined for a CBP processing facility in Murrieta, but protesters chanting anti-immigration slogans blocked their arrival. As of Wednesday, 40 immigrants were being detained at the Brownfield Station in Otay Mesa, while 42 others were sent to the Imperial Beach Station, 17 were moved to the Boulevard Station and 40 were in quarantine in Chula Vista, according to Border Patrol health and safety director Ron Zermeno. The immigration debate in the U.S. generally operates with a different set of facts, according to Everard Meade, Director of the Trans-Border Institute at the University of San Diego. 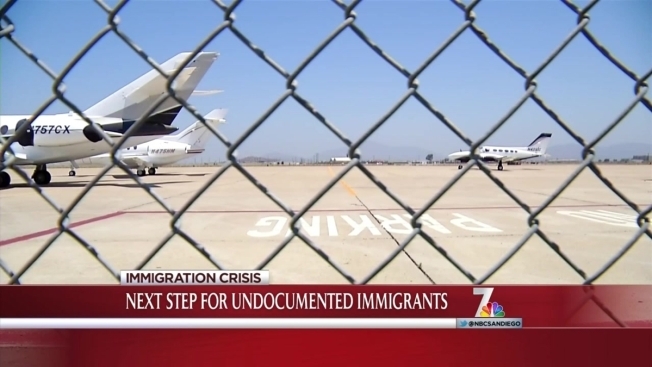 As the debate over the immigrants' transfer to San Diego heats up, a union representative from the U.S. Border Patrol, as well as two advocates for immigrants, spoke with NBC 7 to address some of the most common concerns expressed by opponents of the undocumented minors and families arriving in Southern California. Will immigrants brought to Southern California be allowed to walk out the door? Some community members who oppose the immigrants' transfer said they worried they will be allowed simply to walk out the door of the centers where they are being processed. U.S. Border Patrol union representative Gabe Pacheco said that’s not exactly the case, as the immigrants will be processed and eventually turned over to U.S. Immigration and Customs Enforcement, and later must come back for a hearing. “They may have a phone number of a relative someplace. They may have a destination. So they will be released on a promise they’re going to come back for an immigration hearing,” he explained. If the respondent does not show up to court, they will be put on a removal list, according to San Diego-based immigration attorney Jacob Sapochnick. Immigrations and Customs Enforcement officials say about one-third of immigrants released do not show up for the hearings. The ICE fugitive operations team must then track them down. ICE officials told NBC 7 that the team had more than 469,000 people they were looking for nationwide in 2012. Why doesn't the U.S. send undocumented immigrants back to their countries of origin? Many opponents have called for the immigrants to be sent back to the countries they left for the U.S., but immigrants' advocates said the solution isn't that simple. Victor Torres, a lawyer with the National Council of La Raza (NCLR), the largest national Hispanic civil rights and advocacy organization in the U.S., said that simply deporting these immigrants would be against the rule of law, which dictates that unaccompanied minors from Central America cannot be sent back on a simple basis. Torres said the immigrants are being treated under the laws that currently exist. The laws, he said, require these children to be taken out of Border Patrol custody and put into the custody of Child Protective Services. Enrique Morones, the director of the San Diego-based non-profit Border Angels, said the immigrant children will be held for 72 hours, under a law that was passed under the Bush administration. They will then be turned over to family members who live in the area, if they have any, or moved to someplace else where they can stay. Pacheco said the immigrants should see an immigration judge who will decide if they can stay or will be flown back to their country of origin. Do undocumented immigrants pose a public health risk? While there are reports of detained undocumented immigrants being quarantined for conditions like scabies or head lice, Lila Schmidt, M.D. with Scripps Health in San Diego, said risks need to be put in perspective. “There is no difference for them coming here versus us going there,” she said. Treatment and tracking are key – something federal officials admit is difficult to do. "Test them, treat them, follow up and if you do all that you should be safe. Nothing to fear,” Schmidt said. Pacheco said the immigrants were undergoing medical examinations before being turned over to ICE, and that some of them had been quarantined for medical conditions like scabies or head lice. Still, Pacheco said that although some of the immigrants may have health conditions, many others are perfectly healthy. Andy Carey, Executive Director of the U.S-Mexico Border Philanthropy Partnership in San Diego, said false information that these immigrants are violent or disease-ridden perpetuates hatred. “All those people who are perpetuating those falsities are really creating more fear, more anxiety and more hatred,” he said. Carey said philanthrophy can bring together both sides to create a dialogue and look for solutions to an ongoing problem. Is taxpayer money spent on medical bills for those coming into the country sick? A spokesperson for Rady Children’s Hospital where two children were treated for minor medical conditions said he could provide information on who paid for the visits. He said it’s not safe to assume taxpayers paid for it. Why don'tthese women and children enter the U.S. "the right way?" Pacheco said many of the latest wave of immigrants are coming from Honduras, El Salvador and Guatemala. The transfer of immigrants to San Diego comes amid a recent spike in the number of unaccompanied children crossing into the U.S., sparking what President Barack Obama has called a "humanitarian crisis." “They look at this as an opportunity to leave that country and come directly to the United States and grab the American dream,” Pacheco said. He agreed with the argument that the undocumented immigrants being transferred to San Diego should have entered the country legally. “There are lots of people who have immigrated to the United States legally and have paid their fees, who have been medically screened, and all the steps they went through. This is just a big affront to them,” he said. Pacheco said each immigrant would be processed and eventually turned over to ICE, but the influx is still putting a strain on national security. Sapochnick, the immigration attorney, said coyotes have been building up the rumors that children have a "get in free" card for two years. “The rumors abroad are that if you send your kids, they’re going to be able to stay there somehow and eventually they’re going to be able to bring you as their parents,” he said. Serra Mesa resident Alejandra Ceja-Aguilar, who was just 5 when her parents dropped her off at a restaurant near the Arizona border with Mexico, said her own parents were trying to protect her and her younger sister from the cartel violence and drug activity in Michoacán, Mexico. San Diego-based Border Patrol agents have reported seeing 642 minors crossing the border this year, a 55 percent increase over last year.